VIDEO | Gulmarg’s oldest church rang wedding bells after three decades and How ! An Australian couple in Indian wedding attire; dozens of foreign skiers wearing Kashmiri Pherans as guests, local priests and snow all around. And when the ceremony ended, Kashmiri music and food followed in the evening. This was the wedding of Australians Tim Robertson and Kate Hamilton Thursday at St Mary’s church in Gulmarg. It was the first in over three decades at Kashmir’s oldest Protestant Church. Engaged for a year and fond of snowboarding, it took the couple six months to plan the wedding in Gulmarg. “That day (last year), we were snowboarding back home and we decided to get married. But then Kate wanted a white wedding and in the mountains,” said Tim. A friend of Kate’s who organises skiing trips to Kashmir was roped in and a year later, their wish was fulfilled. But until Thursday afternoon, minutes before the ceremony the couple walked to the church as heavy snow swirled all around. “Until the last moment, we were not sure that things will happen smoothly. We were surprised to see the skiers at our wedding. I don’t think we could have done this ceremony the way it happened here at any other place. I am speechless,” said Kate. The couple also had a backup plan if the local priests did not turn up – exchange rings with each other. Despite the heavy snowfall in the Valley, however, two priests from Srinagar travelled to Gulmarg to perform the wedding. “I was also unwell. But, despite all that, I decided to go to Gulmarg. Because it was for the first time in my life, that a marriage was held at Gulmarg, I didn’t want it to miss at any cost,” he said. Khaver Jeelani, Managing Director of Hotel Highlands Park Gulmarg, who organized the function for the couple says that the first wedding at Gulmarg in his life time, will definitely send positive news outside. “When I received the news six months ago that they want to marry in Gulmarg, for a moment I thought it might not be possible. But, it went very well and I am happy. It will send positive news outside and a message that Kashmir is always safe for tourists,” he said. The couple shares that how the hospitality and warmness from the Kashmir people will bring them again to this place. “We will definitely come again here next time, because this place is amazing. We have now so much of memories with this place,” says Tim. J-K Tourism Department officials say that the event is “of great importance”. 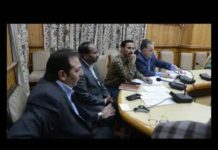 “Destination marriage happening here after a long time is great news for everyone in Gulmarg…” says Nasir Mehmood, Tourism department’s senior official at Gulmarg. An Australian couple got married in Gulmarg yesterday,In last 40 years this is the 2nd marriage held in St.Mary's church in Gulmarg and organised by Patric William Barker and Natasha Katie Pritchard the founders and foreign ski tour operators.